click on image for other IWSG writers! 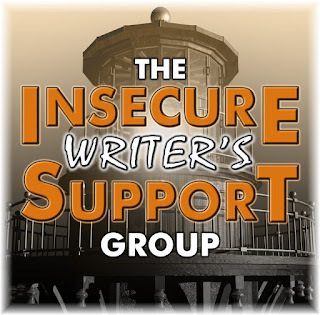 IWSG: a place where writers and friends share woes or hugs. I lack the confidence in what I should write about in a blog. I know that we need to write about stuff readers find useful, but how do I write with that kind of authority? I am so ordinary and feel as though I don't have much to offer. I have a fabulous friend who discovered she has Asperger's at age 33 and has a very informative blog. There are writers who blog about great publishing tips and secrets. There are others like Wellness Mama! I need to up my ante but feel at a loss. What thoughts or ideas do you have on how I can improve? I've had the notion that blogging could be an online journal, I suppose. But I think it's hampering when I think of that fact that I might not get any hits or comments. I don't like that because I should do it for me and not anyone else, right? I've read articles on how to write blogs and to write what others might find useful, a way to capture an audience as well as email subscribers. It that is to be my goal, I'm already at a loss because it goes back to: What do I have that others find useful? Uh... I have no idea. I don't think you need to be educational or informative, at all. Entertaining is good enough, and building the community is always a welcome service. I think you build authority as you go along, most of the time. Hi Elizabeth, just write about whatever inspires you or what motivates you. Writing about the lifeskills/lifelessons you have learnt in your journey as a author/parent too will be great. Thank you! I'll be all over the place on this. hehe... I do love this angle. You're so inspiring, Rachna! I've missed you! I think we all struggle with this. There are some great articles out there about it. I started mine as a basic, "this is who I am" blog about writing and the writing life. It tends towards the memoir/autobiographical, but I can't say that's always the best. I tried posting writing prompts and I kind of liked doing that, but they didn't seem successful, possibly because the posts were so short. I have written some "tip" posts and I'm thinking about reviving those. I think almost any kind of series of posts can help a blog - a series about something that inspires you, or something that you just like. If you like a particular genre of novel or tv show, that can give you something to start with - maybe go through how certain novels or shows inspire you to write or create. Just some ideas. Check out Alex's blog, or Chrys Fey's, or Madeline Mora-Summonte (she writes short motivational posts, writing posts, and about her turtles so it's a combo of something tried and true and something different). And, just go for it! Be you! thank you for your inspiring words, Tyrean! Alex for sure is a good role model on internet presence and blogging! What's your passion? Blog about that. I don't even attempt writing tips since I don't feel qualified either. But I can review movies and music and other geeky stuff that many of my readers enjoy. You need to find your passion and niche. True. True. Thank you, Alex! I think it depends on what you're after with your blog. I'm not into staying on one topic only ever, so my blog is pretty random and fairly personal in some ways rather than strictly professional, but everyone's mileage varies. I'm afraid I can't offer much in the way of constructive advice with this one. My own blog has been sadly lacking of late. I admire those who can come up with interesting and entertaining material on a regular basis. I guess most of my creative juices get used up in actual writing and my manuscript. I hope another visitor can be of my help but sending positive and happy writing thoughts your way. I'm sure you aren't "ordinary" at all. None of us are, right? Aren't we all as unique as snowflakes? As for what you write on your blog, just be you. You don't have to write anything "helpful" or authoritative. If something is interesting to you, there's a very good chance it'll be interesting to your readers, too. First of all, everyone of those people you admire have not interesting days. Second, the best way to improve at anything is practice! Also, decide if you're writing for readers or writers mostly. Then think about the blogs/books or whatever you wish you could find. When in severe doubt or an idea drought, google it.I find searching blog topics for writers to be a good start. Hope some of that helped. Oh. Wow. Haha! I'd never thought to look up blog topics! Reminds me of writing class. Nice. Thank you for the idea! I struggle with this, too. These days I steer clear of trying to talk about writing tips etc. because it seems so many people have covered this territory repeatedly and I have nothing new to offer there. I'm not a good person to give advice, but you could try looking at what is unique to you, what do you know or do in a way that no-one else does? These days, I mostly post about aspects of worldbuilding for the story I'm working on, because that's something I know and enjoy, and can probably speak to in ways that don't sound like a repeat of what loads of other people have thrashed to death. But, yeah, it's difficult sometimes. That's a tough question. I started my blog with no idea what I was doing, just knew I was "supposed" to have a blog. In the beginning I was all over the place. I've settled into mostly 3 kinds of posts: book reviews, posts about writing, and photo post (trip reports). Sometimes I wonder if that's the right thing to be doing, since the point of the blog is to make people want to read my books (at least on some level, that's the point). All of which is to say, apparently, that I have no useful advice for you! You have the right attitude! I hadn’t thought of it as a “niche,” but of course it is! It looks like you've already gotten a lot of good advice! I would say write about the things that are on your mind, something that moves or inspires you. The great thing about a blog is that it can be whatever you want it to be. I also think that if you start writing what's on your mind, you'll discover your direction as you go. I try to think of my blog as a conversation with the reader I imagine being on the other end. Ay books are about late-life, my readers tend to have some years on them, and I just turned 82......it seems logical to converse about what we know, experience, or hope for. Your youthful conversation will be different than mine, but having an idea of whom you are talking to seems to help. And then you just charge ahead, insecure like all of us, and having your say. That's a good way to look at it. Thank you for your thoughts, gilguy! I don't have advice for anyone, I really blog to connect with other people. I blog about everyday frustrations, hopefully with a bit of humor, with the idea that we can handle anything with a little help from our friends. Plus, I actually have to write and publish the posts and that helps perpetute my fantasy of finishing my novel. My blog readership exploded when I started posting about topics that would interest my readers (or potential readers). I write dark fiction, so my blog posts are about mysterious places in the world, unsolved mysteries, the supernatural, and true scary stories. The trick is, you also have to be interested in those things, or blogging will become a dreaded chore. So, ask yourself, what would people who'd love your books also find interesting? Thanks for the tip, JH. I really need to get in touch with myself on this!